The Victorian era brought with it wholesome bathroom design changes especially for newest middle class homes; this led to the emergence of the famously known Victorian bathroom design. Indoor plumbing including drainage and water supply was introduced during this time for all new houses. Initially, water was heated on the kitchen stove and then carried to the bathing area. For the wealthy in society, hot water was carried to the bathroom by a maid and poured into a tub. From the middle class downwards, indoor baths were not so common. Indoor plumbing made it easy and convenient to incorporate indoor baths in middle class houses without the need of hiring and maintaining maids. Since the middle class during this era had an entrenched culture of showing off, private areas of the house such as the bathroom maintained a modest look as compared to other public areas in the house. This gave the Victorian bathroom its simplistic design. 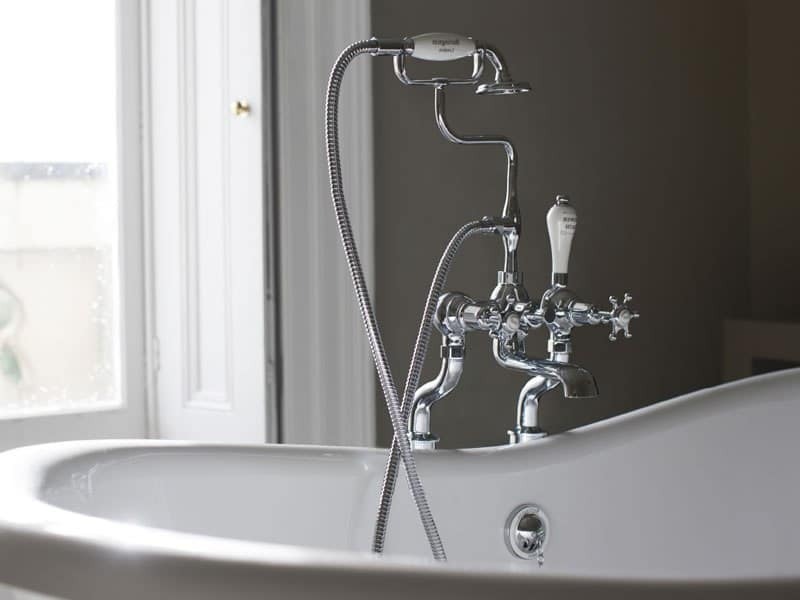 When designing your bathroom to resemble this traditional design it is essential to note that a Victorian bathroom was known to be small, and equipped with only essential bathroom fittings. This means that for a modern bathroom to bear this famous design, simplicity has to be emphasised. The main purpose of a Victorian bathroom was simple, comfortable indoor bathing. The main features were a sink together with a metallic bath tub and washing basin. It was also common to find exposed copper pipes. In some cases, there would be a fire and minimal bathroom furniture. Victorian bathroom designs were characterised by previously existing free standing roll top baths commonly used by the wealthy in society before the Victorian era. These bath tubs stood on cast iron feet and had tap holes at one end. View our range of traditional free-standing baths. These bathing tubs usually came in two sizes one standard sized while the other which is much large could also be used with a shower, commonly referred to as canopy baths. Another variation of baths originating from France was characterised by the distinct placement of the water taps at the middle of the tub as opposed to the common positioning at one end. 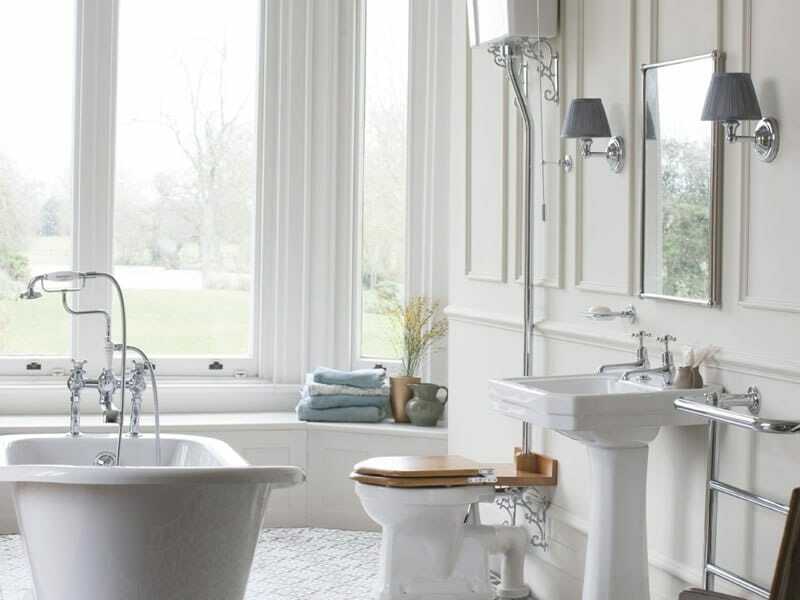 One of our favourite suppliers of traditional bathroom products are Burlington Bathrooms. Where we offer a full range of Burlington products in our on-line store. Traditional bathroom designs did not include toilets. Toilets were commonly located outdoors or in a separate room. In most cases the toilet seat was made out of wood, with the ceramic pedestal being washed down by water from a cistern. The stand out feature of this traditional bathroom toilet is the pull handle connected to a chain. Today you can find many toilet variations that have used the same design to carry on this traditional design. 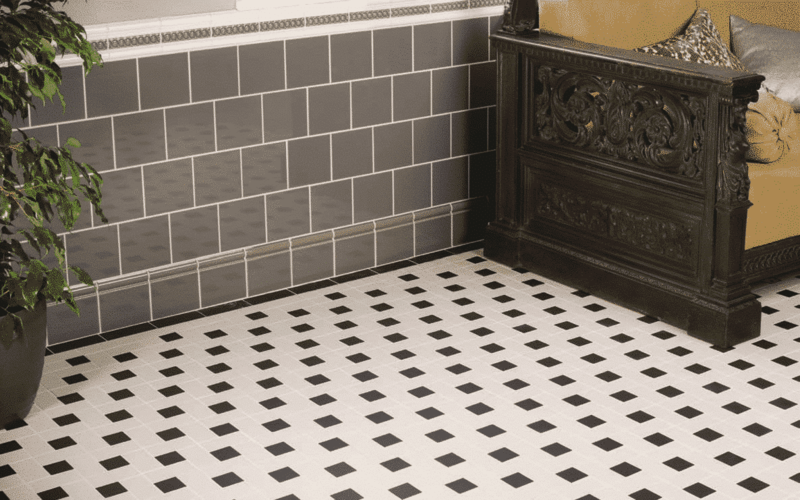 Another standout feature in a Victorian bathroom is the floor design. Bathroom floors were made using either bleached wood or tiles for easy cleaning. White tiles and wallpaper were commonly used to cover the floor and bathroom walls respectively. If you’re looking for a Traditional Victorian Bathroom why not visit our on-line store for a wide selection of products. Alternatively visit our Bathroom showroom in Leeds where we would be happy to design a bathroom for you.